(Updated at 6:15 p.m.) Richmond-based Ravenchase Adventures is opening a new escape room along Columbia Pike. Signs are up for the business, which is located in the same building as William Jeffrey’s Tavern, near the corner of Columbia Pike and N. Adams Street. 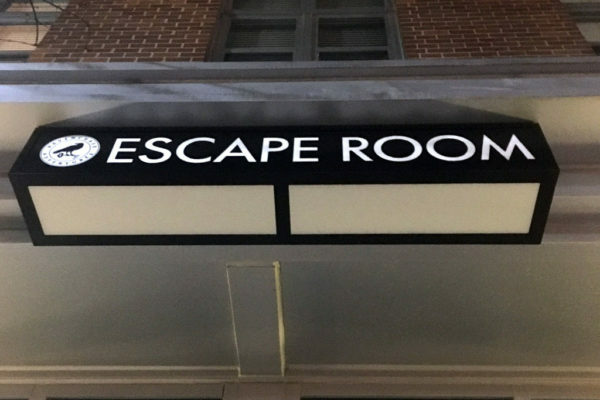 Ravenchase — which describes itself as offering “elegant adventures for the spirited intellectual” — has existing escape rooms in Richmond and Herndon. The Arlington location is listed on the company’s website as “coming soon,” while the last Facebook post for the business said it would be opening in December 2017. A company rep emailed ARLnow.com after publication of this article to say that they were now hoping for a “late spring” opening.